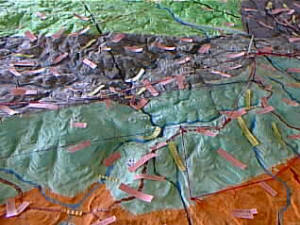 This 1:10,000 scale (2 x vertical exaggeration) Participatory 3D Model of Cherangani Hills was completed in August 2007 in Trans Nzoia, Marakwet and West Pokot Districts of Rift Valley Province, Kenya. 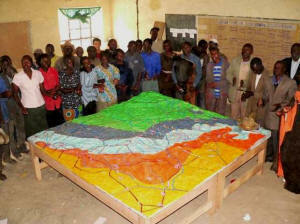 This 3D model covering a total area of 576 km2 has been the second Participatory 3D Model made in Africa. The exercise took place thanks to the financial support provided by the Rainforest Foundation UK, and the coordinated effort made by the Sengwer Peoples, ERMIS-Africa, Shalin Ry and the Indigenous Peoples of Africa Coordinating Committee (IPACC). A total of 65 representatives from 13 sub-tribes attended the training. These included the following: Kaplema, Kamengetiony, Kipsirat, Kapteeteke, Kapsormwei, Kimarich, Kaasango, Kaptapkitiny, Kapkutung, Kapchongwony, Kaptokom, Kapumpo and Kapchepar. Elders populated the model with their memories and reconstructed the present landscape. Sengwer is an indigenous group of the Nilotic descent. They speak Sengwer language which is closer to that of Sabaot and Keiyo communities. They live on hunting, gathering and a bit of farming and are distributed within their ancestral boundaries into three administrative districts of the Rift Valley province in Kenya: Trans Nzoia, Marakwet and West Pokot. The Sengwer mapping has been a follow-up to the highly successful mapping of the Mau Forest Escarpment by the Ogiek people of Nessuit in 2006. Acceptance by KfW Development Bank to fund community projects (Construction of a primary school, health centre, provision of water, electrification and road construction). Already Kshs 20 million has been set aside for the projects. Nonetheless, the situation evolved for the worst and in 2013-2014 there have been forced evictions of indigenous communities from the area. Kushner J., Langat A., Chavkin S. and Hudson M. 2015 Burned Out: World Bank Projects Leave Trail of Misery Around Globe. The Huffington Post. Consulted online on 10 January 2016. _________ 2007. Proposed Kenya Water Supply and Sanitation Improvement Project (WaSSIP); Indigenous Peoples Planning Framework (IPPF), September 2007, Republic of Kenya, Ministry of Water and Irrigation.